I would like to ask about the stretch zones. There are a lot of sinkholes lately and they are appearing mainly all over the Eurasian and North American plates. They are appearing in the areas which according to the other criteria would be assumed as safe locations (far from volcanoes, mountain building, landslides and well above sea level). Is there any pattern to follow to estimate where would be a high probability for the sinkhole to open for various micro locations, because we can assume that we are in the safe location and next minute, the sinkhole opens beneath us swallowing everything? Sinkholes almost invariably form in areas subject to karst limestone cavern formation. Underground water flows eat away the limestone leaving vast caverns and caves, which often give scant indication above ground that a cavern lies below. 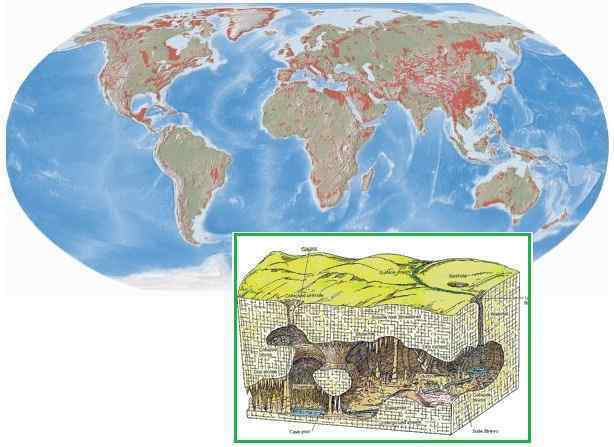 Karst limestone rock formations have been mapped and are known, however, but since one never knows just where a cavern might have formed, this provides little help in predicting just where a sinkhole might form. Sinkholes open up when the rock is fractured due to stress from being in the stretch zone, from the bending of a plate, or due to torsion. To avoid the horror of a sinkhole suddenly opening up under one’s feet, one should avoid living in karst limestone regions. China is riddled with huge sinkholes, which are opening up due to the bending of the Eurasian Plate there as the Sunda Plate sinks. The Appalachian mountain region, including the sinkhole ridden State of Florida, has karst. Central America such as in Guatemala, Europe such as in Portugal or Spain or Russia, and Australia also have karst formations.